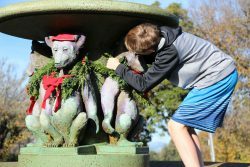 The tradition of decorating the Fountain at The Circle for the holiday season was carried out again this past weekend, as volunteers with Friends of the Fountain and Walk added greenery and lighting — and snazzy holiday outfits for the fountain’s four grizzly bear cubs. Last week, a crew led by longtime FOFW president and volunteer coordinator Sara Holmes crafted the wreaths that now encircle the bear cub’s necks. Pictured here are Sara (at right), along with (from left) FOFW board member Pat McKee, Ann Hasse and Ann Goldman. 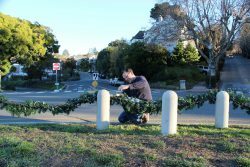 On Saturday, Dec. 3, volunteers led by FOFW board member Scott Dunlap (pictured) added swags of greenery to the chains along the perimeter of the islands in the center of The Circle. 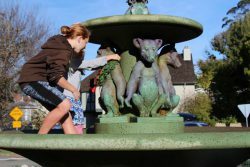 Neighborhood youngsters climbed aboard the fountain to place the wreaths and bows on the bears there. 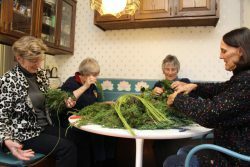 Pictured are Lindsay and Lauren draping the first wreath together, and Morgan adjusting the final wreath. The cubs also each sport a yarmulke-like cap in recognition of the celebration of Hanukkah. The holiday décor will remain in place through December and into early January, brightening The Circle as the days grow darker. Friends of the Fountain and Walk wishes everyone in the Berkeley community a joyous holiday season. It is our pleasure and privilege to help the city care for this historic landmark. And we could not do it without your support for our efforts. Go here to learn more about FOFW, or explore the history of Berkeley’s first public art here. To make a tax-deductible donation, go here. Or learn about other ways to become involved with FOFW here.